I was about to reply to your post last night but, since I'm new here, I wasn't familiar with what you were talking about. 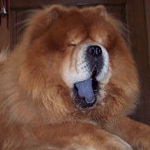 It seems like the chowchow forum is much less active than it probably used to be, unfortunately. It took about a week for me to get a response to my first post...and I didn't get the "welcome! "s that people seemed to get a few years ago. You were actually the first to try and help me out, so thank you! If that's not what the ellipsis are for, I'm sorry. I'm just trying to help...hahaha Your dog is very cute, btw! Brianha, sorry for the delayed responses. I try to welcome newcomers, but have been pretty busy lately. Managing 3 chows at home, with 2 intact males. Both of them actively showing. And my female beginning another heat. If you need anything quicker than the standard post responses, send me a PM. I get those quicker. No worries guys....I just had surgery, on tons of drugs and after I looked at it when I woke up, it just felt stupid. Group has never been overly active...lots of lurkers, but not new here. Just took a long break after going through a big disappointment with Ro's breeder. Those that know me, knew I waited for a chow pup for over a year and then I just felt, broken for awhile when I found out the breeder wasn't very ethical. I worked through it, I love Ro but as you saw in another post...I had to work hard on getting to that place. I just had to accept some things that I was hoping for weren't going to happen. Anyhow, I all ready know Rory...wave! Nice to meet you Briahna, hope to get to know you better. PS Pretty sure I'm still looped up on drugs...hey surgery, enjoy the perks while you can. Oh, I knew you werent a newbie. Im just awkward, lol. I often find myself struggling to find good things to say and then I just end up being weird and confusing. Haha, don't mind me. What did you have surgery for, if you don't mind my asking? And it's very nice to meet you as well! All good, I love your personality [if you're on fb, feel free to pm me and friend up...I share tons of pics there, I'm the freaky dog nut]. I won't say what this surgery was for, but will for my next one and that is for osgood's sclatter [probably misspelling it] disease in my knees. Just doing one knee to see how successful [or unsuccessful] it is. Not looking forward to it, at all. Bleh.